Early on a weekday morning, we step into a group meditation session. The space is silent except for the soft whisper of breath flowing in and out of 16 four-year-olds seated on the floor all around, each deep within his or her own experience. After allowing enough time for this morning quietude to fully engulf the collective consciousness, the instructor gently invites the group of children to transition from stillness into a series of yoga poses–connecting the internal to the external, raising the energy of the space, preparing minds and bodies for today’s learning. Where were we just then? In a remote monastery, high in the Himalayas? Wait a second…this is the Austin ISD Social and Emotional Learning blog! We were in Mr. James Butler’s Pre-Kindergarten classroom at Gullett Elementary, right here in the ATX! This story does wind up here in Austin ISD classrooms, it’s true–Mr. Butler came to Gullett Elementary after teaching Kindergarten at T.A. Brown Elementary, where he started integrating mindful breathing and movement into his daily teaching practice. However, the roots of his mindfulness pilot curriculum were planted during his year teaching English and Math to high school students in Namibia. In that tumultuous environment, he found that trying out breathing and stretching activities with his students brought a deeply-needed sense of calm and safety to his classroom. As a result, more teaching and learning occurred. At that point, there wasn’t a curriculum or particular plan–it was just a way for him and his students to connect within themselves, with each other, and with learning. He brought that teaching experience back with him stateside when his time in Namibia was up–and found that re-entering loud, high-tech, consumerist American society from a Namibian hut with no electricity was a jarring and difficult transition. By deepening his own mindfulness practice, he was able to regain vision and purpose, leading him to start teaching again here in Austin. With his experience in Namiba and strong personal commitment to mindfulness, Mr. Butler started to turn it into a lesson plan, building it in right around academics. His subsequent success garnered the attention of his fellow teachers, his administrators, and ultimately the AISD superintendent. In 2014, he was named AISD Teacher of the Year. 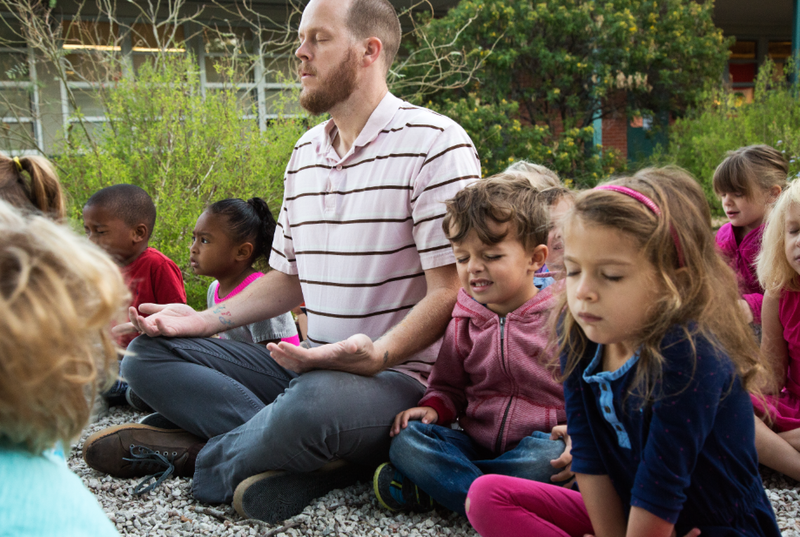 James Butler now helms a pilot program of Pre-K mindfulness, with 45 participating classrooms in 15 elementary schools. He creates and distributes a curriculum each week, providing age-appropriate activities and lessons to raise self-awareness, build mindfulness, and increase confidence. The curriculum’s activities come from various resources, with modifications to create relevance for all students from Pre-K through 3rd grade. He presents to schools and trains teachers in the curriculum, encouraging each teacher participant to build their own mindfulness along with their classes, and adapt curricular experiences to their own personality, class needs, and school structures. Mr. Butler’s mindfulness curriculum includes breathing and stretching activities designed for multiple times during the day, and recommends 1-3 minutes of mindful breathing and 1-3 minutes of mindful stretching at the very beginning of the class. All the activities in the curriculum are 1-3 minutes long, and can be used together or one at a time, depending on time considerations and class structures. Mr. Butler and the teachers who are testing out the mindfulness curriculum report significant positive outcomes, even if mindfulness activities comprise just 2-5 minutes out of the school day. Because students learn how to check in with themselves and observe how their bodies and minds feel, they are better able to manage strong emotions and address academic challenges. Instead of tattling, Butler’s students give him “Teamwork Reports” of problems solved and lessons learned during group work and social situations. It’s not unusual to see a pre-kindergartener using belly breathing techniques to calm herself down on the playground. And teachers using the program have told stories of students using mindfulness practices at home, when stressful situations with parents or siblings arise. Indeed, these students often become the teachers for their families, modelling and describing mindfulness activities that benefit everyone! James Butler is grateful for the opportunity to work on mindfulness with the youngest students in our district, because the benefits, even from mere minutes a day, can teach valuable life-long skills. He says that beginning his own mindfulness practice as an adult has helped him work though years of issues that beset him as a young person. He truly believes that learning these skills earlier can profoundly increase quality of life and reduce the negative effects of trauma and adversity. They also improve focus and resilience for academic learning, and create a classroom culture of safety and connectedness. Mindfulness for the win! Speaking of the win: it should be noted that Mr. Butler’s class voted to collectively self-identify as the Bubbles, which narrowly edged out the Squishy Crystals in the process of class-name choosing. Congratulations, Butler’s Bubbles–y’all are leading the district on the quest for mindful classrooms! Namaste!